I’m pretty sure that even those of you who are not familiar with the detective genre have heard the name Sherlock Holmes. A truly brilliant sleuth, a master of deduction, an expert in chemistry, a talented violinist – he is by far the most famous fictitious detective, a real icon if I may put it that way. Imagine my excitement, as both an anime and Holmes’ fan, when I learned about the existence of ‘Meitantei Holmes’. As you may already have guessed, I immediately put it on my ‘to-watch’ list with a top priority. And soon enough, I watched it. And what I watched was… something completely different from what I had expected. The first thing that alerted me was the canine appearance of the characters. But really, I have seen much weirder ideas put to a good use – as long as characters acted like humans, I won’t mind their looks whatever they are. So, in the end, it didn’t bother me very much. What bothered me much more is that instead of faithful adaptations of original stories I received a set of action-packed (with almost no detective intrigue), somewhat childish episodes with dog Holmes thrown into. The only Holmes’ stories I can think of that were adapted into this anime are ‘Sign of the Four’ and ‘The Engineer’s Thumb’, but the anime follows the plot so loosely, that almost nothing was left. Holmes’s nemesis, Professor Moriarty, is introduced early – and since his appearance, ‘Meitantei Holmes’ is nothing but a constant fight between the two. Basically, every episode goes like this: Moriarty comes up with an evil(though not very clever) plan, soon he sets his plan into action, everybody is in the state of a panic, but Holmes sees through ingenious villain’s plot and destroys it, in the end everyone’s happy(except for the Professor, of course). Luckily(or unfortunately for those who wanted more variety in the series), Moriarty doesn’t let anime end because he escapes at the very last moment – to return in the next episode. As you can see, instead of real(at least more realistic) crimes, questioning of suspects, evidence gathering and deducing the truth behind the cases we received a light-hearted anime with a soft atmosphere where good always takes over evil. Obviously, it feels more like fairy-tale than a detective. Why did it turn out like this? 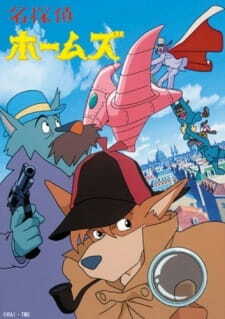 There are multiple reasons for that: clearly the authors had in mind from the beginning to make this into a family-friendly anime, and Conan Doyle stories weren’t suitable for that; the involvement of Italian animators may have also had its influence; Miyazaki, who took part in the making of this anime(he directed only six episodes, though) was also changing his style from lupin-esque to more ghibli-esque – so everything came together. But all my criticism doesn’t mean that the anime is bad. One thing is for sure – thanks to the involvement of Italians, we got wonderful artistic style and great animation – a feature very rare in the 1980s anime due to low production costs. Visually, ‘Meitantei Holmes’ looks better than most titles of the nineties. The series is sure fun to watch. It has good production values, nice and warm atmosphere, beautiful Victorian setting, decent cast of characters. Obviously, it is one of the best ways to introduce children to Holmes(however, it doesn’t mean that adults can’t enjoy it). Overall, ‘Meitantei Holmes’ is a good and somewhat unique anime – seriously, where else can you see canine Mrs. Hudson participating in an aeroplane chase?! – that is definitely worth checking out. My opinion of it changed while watching from a rather cold attitude(I’m a detective purist, after all) to a much warmer one after I adjusted my expectations properly. So, all in all, ‘Meitantei Holmes’ is a good and worthwhile anime that can be recommended to anyone who’s into old anime – just don’t expect real Holmesian mysteries from it, and I’m sure you will find it enjoyable in more ways than one. At first, I thought this was going to be serious like all the other Sherlock Homes creations out there but this is like a children’s version of the story. It feels strange to see Professor Moriarty actually taking part in the crimes instead of just having his henchmen doing it. It pulls away a lot from the normal story line with the difference that each show can pretty much be standing on its own and you don’t need much to understand them. It’s like a crime of the week and I don’t remember if there was any that actually went 2 shows long. I like how whimsical they make the story and it has some of the feel as the real Sherlock Homes, although they don’t really let you try to piece together the crime yourself which makes me rather sad. I never really liked the music to it but I love the animals being portrayed as humans. Though sometimes the dogs look like cats such as a very small boy in one of the episodes. I wasn’t surprised when I found out that Miyazaki actually helped create this show even if some of it wasn’t the greatest. I’m pretty sure if the Character has been a human it's will be one of greatest anime in the history everything is good but the Character and store is kiddy . Art ‘Meitantei Holmes’ is the best things i like it, thanks to the involvement of Italians, we got wonderful artistic style and great animation,Meitantei Holmes’ looks better than most titles of the nineties. when i saw it in first time in aonther recommendations i thinking it's for children, but if you like sharlok you will be like ‘Meitantei Holmes’ . the Sound and music, i really liked the music it's not mannered .